WaterAid has created an installation to draw attention to the number of children who die globally each day due to a lack of access to clean water. 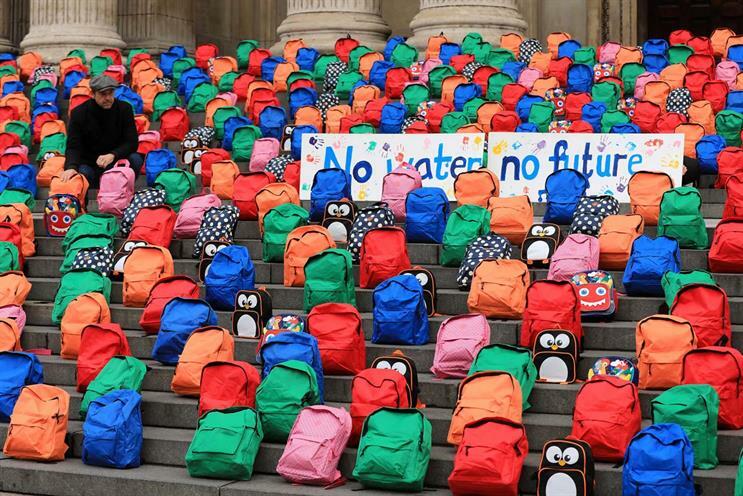 House of Experience, part of The Current Collective, crafted the stunt on the steps of St Paul’s Cathedral, with 800 schoolbags representing the number of lives lost each day. Each of the cathedral’s 24 steps represented one hour of the day and was lined with 33 schoolbags to represent the number of children younger than five who die every hour. The schoolbags were chosen to represent an entire class that never made it to school due to poor sanitation and the lack of clean water. The bags in the front row were labelled with the names of real children around the world who had been affected. Marcus Missen, director of fundraising and communications at WaterAid, said: “Every single day, around 800 children under the age of five die because they are denied access to clean water and decent toilets.